save time. save money. make decisions. make sense of your data. Viewing Crystal Reports just got simple. CR Dispatch enables you to view Crystal Reports as quickly and simply as possible. 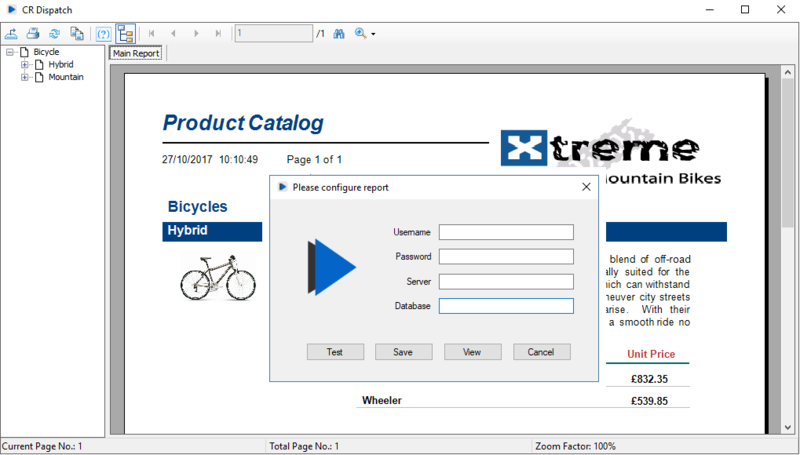 was to develop a “basic” Crystal Reports viewer that would enable you to view a report, securely, with only one click of a button. We like to think of CR Dispatch as a Crystal Reports shortcut. View, Navigate, Filter, Export, Print, Search, Bookmarks, Drill-down, Zoom etc. You can read more about CR Dispatch by downloading the user manual. Please contact us if you are interested in purchasing a licence of CR Dispatch for only $10 USD. Affordable Site/Company licences and a full source code licence for Enterprise/Government clients are also available. Each CR Dispatch license gives you the right to install the software on a single PC. you must purchase 1 licence per permitted named user. Return Policy: APB Reports provides a free 30-day evaluation of CR Dispatch. This allows prospective buyers to evaluate and test the software to ensure it meets their requirements before purchasing. Due to our free evaluation, we do not offer any refunds/returns after a purchase has been processed. Free software updates will be provided for 12 months starting from the purchase date. After 12 months you may continue using CR Dispatch for free, however, if you want additional updates you must renew your licence(s). Note: CR Dispatch is powered by the SAP Crystal Reports runtime (v13) which means it is free to run on a Windows PC. installing CR Dispatch on Citrix or Terminal Services or similar server software. If you haven't already purchased a licence of SAP Crystal Reports we recommend doing so today. Please contact us if you are interested in a free 30-day evaluation of CR Dispatch.